I See a Monochromatic World. There are three things that have visually stuck with me since childhood. The look of the “Worldbook Encyclopedia” lined up on a bookshelf in the rec-room, with their white, green and gold spines creating a rippling band of color. The pages of all the “Childcraft” with their fantastic illustrations. A monochromatic globe that my grandfather gave to me and my older brother. All of these items at the time were tools that helped shape my formative education, and develop my curiosity about discovering new things and constantly learning. They also subconsciously tuned my design aesthetic. At the time I know I wasn’t consciously aware of things like page layout, typography, photography, color, yet the choices made by the design teams that created these three items have stuck with me. Today for some reason I was thinking about wanting a globe. I’m not sure why. I don’t know where I’d put the thing. I started searching the internet looking for one and most of the globes I found were old world looking, and antique styled, or cheap looking light up, use it in my Jr. High science class styled. Then I came across something that looked almost exactly like the globe I had as a kid. Designed by Jakob Wagner and Louise Christ for Menu +, this 12 inch diameter globe is a monochromatic joy. 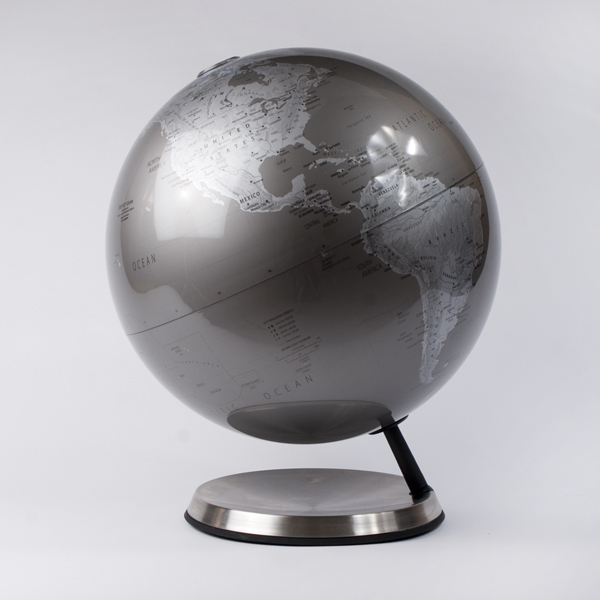 Lifted on a 23 degree axis from a stainless steel the globe is is as attractive as it is educational. It has such a great look. It’s not over run with garish colors. It doesn’t light up. It’s not made of cheap plastic or look like it belongs in the captains quarters of some ancient sailing ship. It strikes such a cool, modern note. Posted in Design and Art, General and tagged Childcraft, Design, Globe, Jakob Wagner, Jakob Wagner and Louise Christ, Louise Christ, Menu, Modern Globe, Worldbook on November 12, 2012 by Author. ← SAHN Bike Helmets for the Sartorial Rider.